Starting Point: Services for Victims of Domestic and Sexual Violence has organized a number of community events in April because it is national Sexual Assault Awareness Month (SAAM). These events are meant to raise awareness, build community and raise funds to assist Starting Point’s clients who have experienced trauma through domestic violence, stalking and/or sexual assault. On Tuesday, April 3, which is National Day of Action for Sexual Assault Awareness, the Wildcat Tavern in Jackson will be hosting Starting Point at its legendary Hoot Night since this year’s SAAM theme is “Embrace Your Voice.” Hoot Night is the valley’s longest running open mic series. It is hosted by Jonathan Sarty, one of the area’s most beloved musicians. 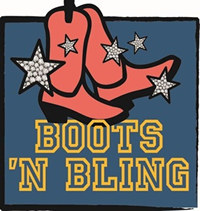 Sarty will also be the entertainment at Starting Point’s big Boots N’ Bling fundraiser on Saturday, June 2. There is no cover charge for Hoot Night, though optional donations to Starting Point will be being accepted. This will be a night for Starting Point’s friends, supporters, staff, volunteers, and clients to connect and celebrate their voices together. The music starts at 8:00pm, but The Wildcat serves dinner starting at 5:00pm. Also on April 3, Debony Salon in Jackson will be donating a portion of all its sales of services to Starting Point. These services include haircuts, colors and blow drys, makeup applications, manicures and more. The salon is open from 9:00am to 8:00pm that day, so you could even go there to get “fixed up” on your way to Hoot Night around the corner! Call Debony at 383-9366 to schedule your services for April 3. Traditionally, SAAM has promoted self-care as an integral part of personal strength, confidence and healing. Also as a part of promoting self-care and healing, a number of local massage therapists have committed to donating a portion of their massage sales to Starting Point for the week of April 8-15. These therapists include: Ginger Rober of Ginger Rober Restorative Health and Massage (986-5037), Katey Brothers-Lambert, LMT (986-5089) and Lisa Moser of Trilogy Massage Therapy(986-8337). Massage is a proven form of stress release and has many health benefits, so take care of you while helping others in the process! A Yin/ Yang yoga class to benefit Starting Point will also be happening at Be Well Studios in North Conway on Saturday, April 14 from 10:00-11:15. The instructor is Renee Bernier, who is also Starting Point’s Prevention Specialist. Please join us to de-stress and energize yourself while helping survivors of domestic violence and sexual assault through Starting Point! SAAM also supports self- expression through all types of art. On Tuesday, April 24, a Sip and Paint to benefit Starting Point will be happening at Jackson Art Studio and Gallery from 6:00-9:00. Bring a friend, bring something to drink and paint a beautiful painting of cherry blossoms with birds. All skill levels welcome! Cheese, crackers and fruit provided. Register online at jacksonartnh.com. Starting Point’s next volunteer training will also be in April. We will host an informational initial talk on April 12th from 6:00-8:00pm that is open to the public to find out more about volunteer opportunities. The subsequent volunteer training dates are: Saturday, April 14 from noon-6:00pm, Tuesday, April 17 from 6:00-9:0pm, Thursday, April 19 from 6:-00-9:00pm and Saturday, April 21 from noon-6:00pm. Starting Point will also be starting new support groups in both Conway and Wolfeboro starting in April. These groups will allow a supportive atmosphere for survivors of both domestic violence and sexual assault to discuss the effects of trauma and how to move forward in their lives in a healthy manner. Please join us in honoring Sexual Assault Awareness Week with Starting Point by participating in any or all of these events. For more information, please go to our website at startingingpointnh.org.